We specialise in extensions and loft conversions for homeowners looking to add more livable space in their properties. From fitting staircases, floors and doors, to smaller tasks – we have an eye for detail, so you can enjoy the finished result. Present us with your ideas, or let us help to inspire you. Our professional craftmanship for carpentry, flooring, plastering, tiling and decorating makes room refurbishment easy. From high-end bespoke units to mainstream Ikea or similar, we fit kitchens and can see your project through to completion with flooring, tiling and decorating. Transform your home’s curb appeal with smartly fitted cladding, decking or fencing. Our eye for perfection ensures a long-lasting end result. Tota Builders are a polite, well mannered team of builders and craftsmen who deliver an outstanding quality of workmanship – to give you the pleasure of seeing a job well done. Trained to use traditional and contemporary techniques, and with an eye for detail, our skills mean that we can usually put our hand to any task. We are resourceful with how we can use materials to achieve a great result. Just present us with the task, and we will find the most cost- efficient way to achieve what you want, to the best standards. Always courteous, reliable and tidy, your peace of mind is assured as we ensure your project completes on time. He is very well mannered, calm under pressure, trustworthy, confident and has a “get on with it” attitude to work. 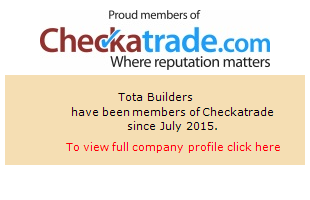 Throughout his time on site, Tota Builders demonstrated great professional skills and good work ethics.